#5 - Little Creatures Pale Ale Little Creatures Pale Ale is one of the most important beers in defining the Australian craft beer scene that we now know. It's Pale Ale packed full of fruit (particularly grapefruit) and floral flavours. I don't think you can call yourself an Australian craft beer drinker if you haven't tried this beer. #14 - Brewcult Milk and Two Sugars Brewcult's owner and head brewer is known as a bit of a mad man. Some of his offerings are really out there and very rarely lack flavour! Milk and Two Sugars was his 2015 GABS offering; it also happened to win the GABS People's Choice award. It's held up remarkably well considering it's about 18 months old at the time of trying. If you want to know more about this beer click here. #44 - Boatrocker Roger Ramjet 4Most craft beer drinkers in Melbourne would've heard of Boatrocker, a brewery in Braeside producing genuinely world class sours and stouts. Roger Ramjet is the bourbon barrel aged version of their superb Ramjet Russian Imperial Stout. It's got masses of chocolate and roast characteristics, while the vanilla that is so present in the original version gets a little lost amongst the bourbon notes. It's a really special beer and would be far higher if not for it's relatively small production quantities. #59 - Holgate Temptress Holgate is one of a handful of brewers in Australia with a Porter in their lineup. Much controversy surrounds the differences between Porters and Stouts, a topic I'm hoping to have a post up about by the end of the year - but that may well spill over into 2017... This beer is little thin, but makes up for it with masses of chocolate and vanilla with complexity arriving through some licorice and roast. It's velvety smooth and drinks dangerously easily for it's 6% ABV. #88 - Bentspoke Crankshaft I had the pleasure of sampling this wonderful IPA at the brewery in Canberra while visiting my Grandmother. It's a really nice IPA packed with pine and citrus hop flavours. At the time I bemoaned the lack of packaged offerings of this beer; which have been answered in the ensuing months with the canning of this beer and their Barley Griffen (Pale Ale). If you're ever in Canberra you have to check out the venue, it's really cool and they produce a very wide style of excellent beers. 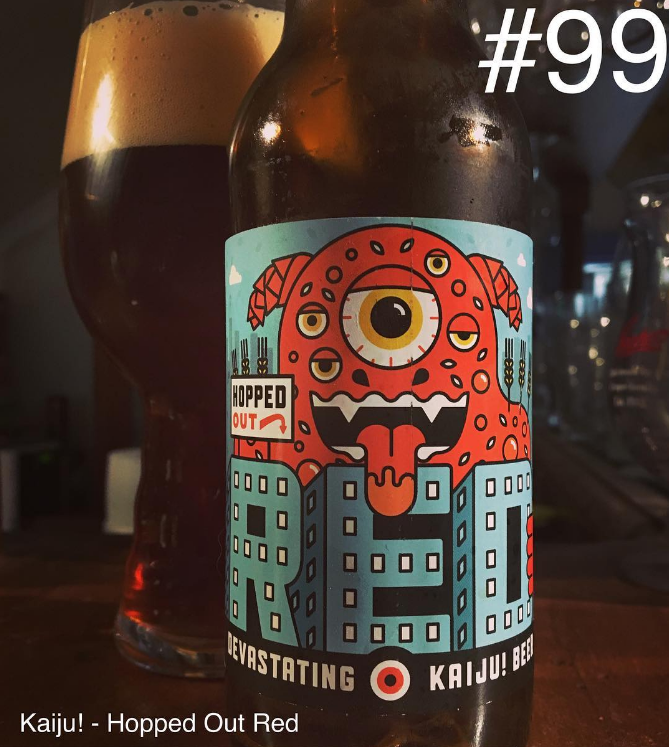 #99 - Kaiju! Hopped Out Red AThe biggest surprise for me in last years Hottest 100 beers countdown, was the 80 place fall of Kaiju's Hopped Out Red! Just like the other Red IPA's that have made the list so far; it's balanced beautifully with caramel malts and plenty of piney hops complimenting each other. I have pledged to return this beer higher up the countdown next year by voting for it; you should too! It's a phenomenal beer that deserves more accolades! Keen to read that porter vs stout piece! Last couple of times I had the Little Creatures Pale it didn't taste right and none of the Bentspoke brews are to my liking either. I'll be certain to try the Hopped Out Red IPA though.